Game Night: Cthulhu Realms | Warped Factor - Words in the Key of Geek. 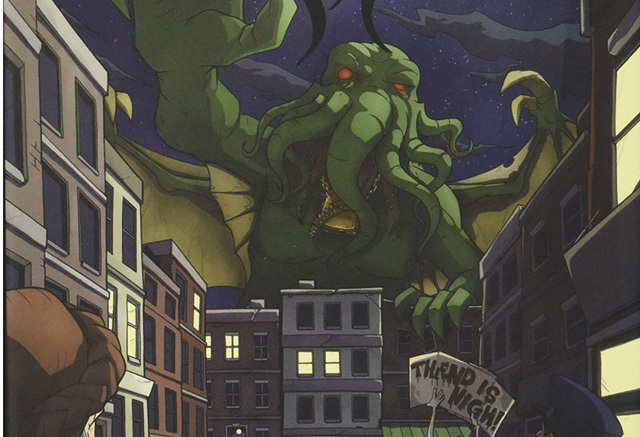 Welcome to Cthulhu Realms, let’s go crazy. No, seriously, you will go crazy, because that’s the point of the game. This is a deck building game for 2 to 4 players. 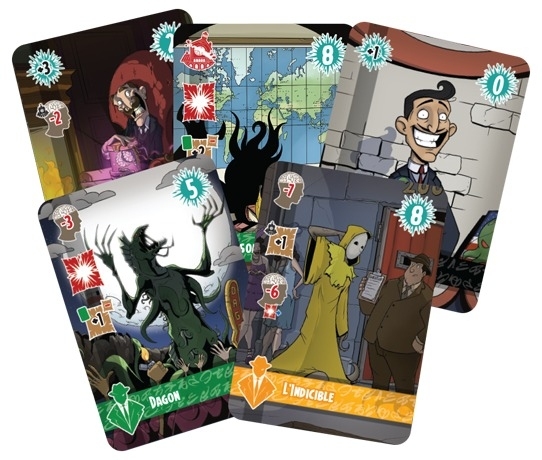 You start with 2 Initiates, 2 Goons and 6 Followers and use them to build your deck, you also get 50 Sanity points to lose through the game. The cards are one of four colours, they have three types and can do any number of things. The black cards are Initiates, Goons and Followers. The purples connect to the town, the sanatorium or the Whateley Farm. The golds connect to the university, the library or Pnakotic. The greens are the monsters. In each there are Entities - people or beings; Artifacts - be they books, fragments, brain cylinders; the Locations are just that - Arkham City/Sanitarium, The Miskatonic Hospital/Library/University, etc. Each card has its own ability, they do different things and they have different costs. Some draw and discard, others abjure (take cards out of play), some give conjuring power, or destroy locations. Locations can protect you, and unlike other cards they stay in play even as your turn ends. The cards you can build your deck from are placed in threes between you and the person beside you. You can only pick from the rows either side of you, not from those between other players - which can be really annoying if those are the cards you want and they’re out of reach. So if I play the Necronomicon, it makes an opponent lose 4 sanity points, but any opponent can defend themselves, if they had say, the Miskatonic Library which is a sanctuary (stops sanity loss). You can also have the likes of Arkham City which is a nexus; that stops your locations losing sanity and descending into Bedlam. Locations can take the sanity hit, and if they take all the sanity that they can, they are broken and go into the discard pile, but if the sanity isn’t that great then the location stays in play. However, unlike the player the location doesn’t retain the lost sanity, it recovers every play. He who goes mad last - wins.